Before unveiling of Windows 9 a week ahead, few website has published several screenshots from a computer running Microsoft's latest operating system. According to Microsoft Preview of the new OS, which will be available as a free download to developers and user by September 30. The leaked screenshots show that Windows 9 will have a functional Start menu. This time Microsoft has recalled the Start menu. 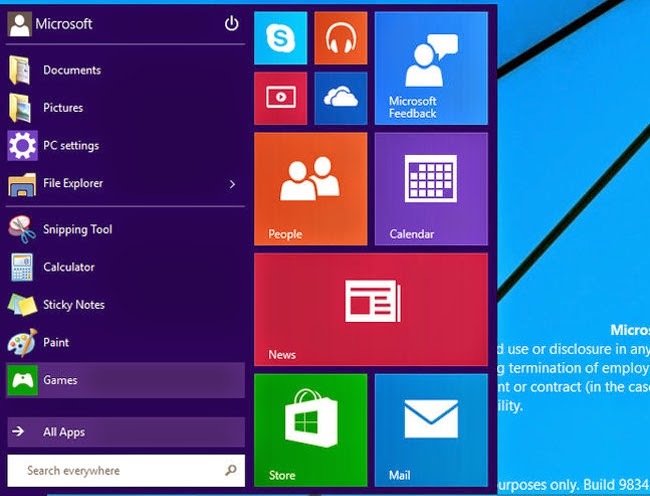 Modern UI apps on desktop: In Windows 9 Microsoft will allow users to run Modern UI apps in the desktop mode. In the desktop mode, these apps will also have re-sizable windows just like the normal applications. Currently, the Modern UI apps run in windows that can be re sized only horizontally. Vertical, they use the full screen. Cureently in Windows 8.1 user has basically two environment one of Apps and other of Desktop which is very much confusing. Notification Center: Windows 9 is likely to have a notification center, similar to one found in tablets and smartphones. It will be accessible from the quick settings on the bottom right of the screen. Virtual desktops: It looks like users will be able to create multiple "desktops" in Windows 9. This means, they will be able to set up a "desktop" for work, a "desktop" for home, a "desktop" for entertainment, and switch between these desktops like they switch between applications, without having to log out or restart the computer. In Nutshell it seems Microsoft is going to focus more on the functionality in Windows 9 from user prospective and user friendly. Let us know your view in comments.